Critics of renewable energy have a full quiver of objections of why we shouldn’t bother developing wind and solar energy. One of my favorites is when they say, “Well renewables are nice, but they can’t scale.” That is, we can never develop enough wind turbines and solar panels to ever make a difference, so we shouldn’t bother. That might have been true once, but it hasn’t been true for quite some time. In most places, including North America, so-called renewable energy policies are in fact policies designed to control or limit the pace of renewable energy growth. Take Renewable Portfolio Standards (RPS), for example. They’re designed to limit the growth of renewables to whatever the status quo—often incumbent utilities--find acceptable. I was reminded of this when I came across an article by Mathew Lockwood on Great Britain’s Solar Surprise. (Lockwood is part of Catherine Mitchell’s IGov team at the University of Exeter.) The “surprise” Lockwood refers to is the success of solar photovoltaics (solar PV) in Britain. 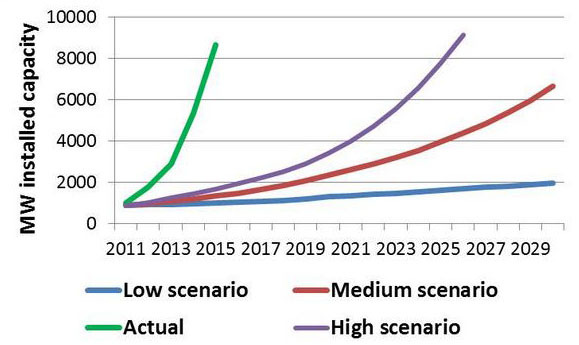 OfGem’s “High scenario” didn’t expect Britain to reach 10,000 MW until some time after 2025--a full decade later. Lockwood quotes one anonymous utility executive as saying OfGem’s plan was “ambitious.” Obviously, the pace of solar PV development took OfGem and utilities by surprise. Just Google EIA forecasts and renewables and you’ll find a number of articles taking the EIA to the woodshed for its slanted forecasts. For example, see Renewable Energy Growth Blows EIA Forecasts Out of the Water, Again by Ben Jervey. Why this is important is that it shows what we can do when we have the policies in place that make it happen—at least in the electricity sector. It shows that rather than ringing our hands and chanting that the end is nigh from rampant climate change, we should get busy and rapidly build out the renewable energy capacity that we need to replace fossil fuels. It shows we can do it, if we want to. Renewables, wind and solar in particular, are growing dramatically worldwide. Like solar PV in Lockwood’s chart, renewables are growing at an exponential rate. That is, like interest on a bank account, the growth compounds on itself from one year to the next. French renewables analyst Bernard Chabot has tallied the growth rate of renewables worldwide and in several specific countries. His 141-page analysis, Global data for power sector, using data from the BP Statistical Review appears at Renewables International. His summary on page 11 is telling. Note that Chabot’s analysis focus on actual electricity generated in TWh not on generating capacity in MW. It’s the electricity generated that’s important. A windmill or a solar panel that’s not producing electricity does nothing to reduce fossil fuel consumption. In the Chabot analysis critics can’t say, “That’s all well and good, but they don’t generate electricity when the sun doesn’t shine and the wind doesn’t blow.” He’s taken that into account. In 2015, existing hydroelectric plants generated 4,000 of the 24,000 TWh of electricity produced. Hydro has been around since the dawn of electricity. It’s well known and well established. Remaining sites for dams are few and far between. Hydro is growing at an annual rate of 3%. At that rate, it takes more than two decades to double hydro generation. That’s a growth rate sufficient only to cover the current growth of consumption worldwide—to maintain the status quo. Non-hydro renewables generated 1,600 TWh in 2015. In other words, non-hydro renewables are producing nearly 7% of total world electricity generation today. Not in some distant tomorrow, but now. Wind contributed most of the non-hydro total, 840 TWh, followed by geothermal and biomass, 520 TWh, and then solar, 250 TWh, mostly from solar PV. Wind grew eight times during the past decade, while solar increased 64 times from a very low base. Another way of expressing this is that the average worldwide growth of electricity generation during the past decade from wind energy was 23%, for solar 52%, and for geothermal and biomass 7%. Altogether, non-hydro renewables grew at a rate of 16% per annum. At these rates, renewables are growing explosively. This is illustrated by the growth of wind energy in China. 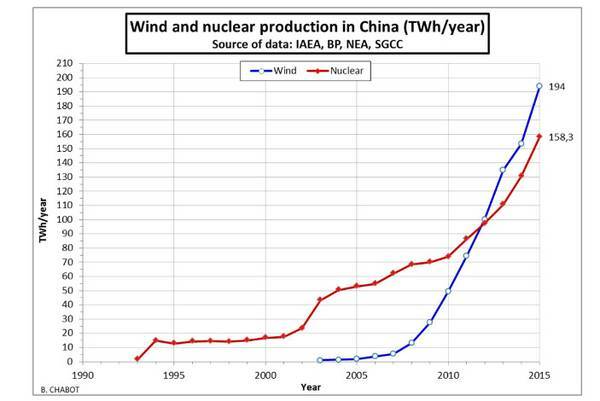 Chabot, in Nuclear and renewables up to 2015, shows how the rapid growth of wind generation has overtaken nuclear in China in the past five years and that’s despite the furious pace of nuclear construction. China is not some Third World backwater when it comes to renewables. China is the world’s largest market for wind and solar energy. Wind generation in China will exceed that in the United States in 2016. Knowing the average growth rates is a powerful tool for estimating how much time it will take for renewable generation to double, then double again. For example, at the 7% growth rate for geothermal and biomass generation worldwide, the amount of electricity from this category will double every ten years. If this growth rate remains steady, geothermal and biomass will generate 1,000 TWh by 2025. If the current growth rates can be maintained for the next decade, wind will contribute about 28% of worldwide generation and solar 66%. The latter demonstrates one of the fallacies of assuming current growth rates from a very low base—essentially solar PV development began only this decade—continue far into the future. This can produce absurd results. For example, if solar PV continued at its current growth rate for only 15 years (to 2030) it would generate several times more electricity than the world currently uses. Even if solar growth gradually declined to something approaching that of wind energy, it’s clear that non-hydro renewables could nearly offset current consumption of electricity. Is this enough to stop climate change? No, not alone. We’ll need to dramatically cut consumption with conservation and efficiency so that we can apply “surplus” renewably-generated electricity to transportation. Regardless of the actual rates in the future, renewables’ exponential growth are making a sizable dent in emissions today—and that’s the reason the fossil-fuel industry is so adamant about stopping it. And they have been having some success. Rather than pushing high renewable growth rates, a number of countries and jurisdictions (Germany, Spain, Italy, the USA, Britain, France, and Ontario) are dialing back their renewables programs just when we need them most. Sure, renewables are continuing to grow, but not at the pace they once were or that they are capable of. Only China is proceeding full speed ahead. Certainly, non-hydro renewables’ rapid growth justifies getting on with the task at hand. Instead of limiting the growth of renewables under restrictive RPS programs, we should be pushing wind, solar, and other renewables to expand as fast as possible. Our climate is at stake.